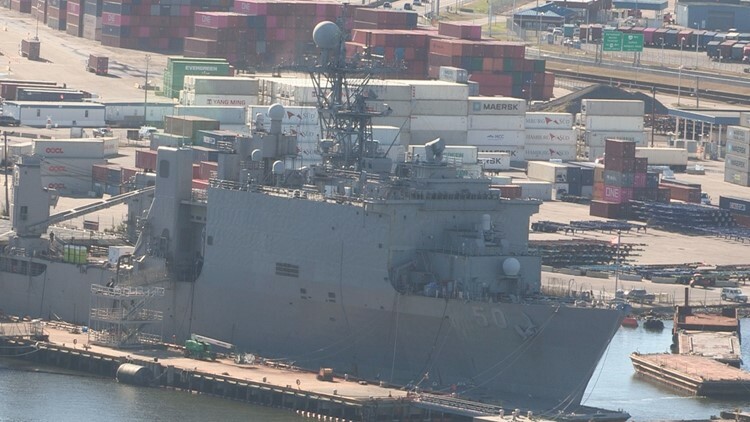 PORTSMOUTH, Va. (WVEC) — The US Navy said that a security sweep turned up no signs of a shooting, after receiving reports of an active shooter situation at a Portsmouth shipyard. Portsmouth Police received a call 11:46 a.m. for an active shooter at 2 Harper Avenue, which is on the property of the General Dynamics shipyard. A spokesperson for General Dynamics tells 13News Now that there was "an incident" on a berthing barge. The barge was located next to the USS Carter Hall (LSD 50) at the shipyard. "Taken very seriously, the ship’s security forces swept the barge but found no evidence of a shooting, no victims, no weapons, no peril," a Navy spokesman said in a statement. Police then completed a second sweep of the barge and surrounding areas, and combined sweep with Navy security and police was completed at 4 p.m. The lockdown aboard the USS Carter Hall was lifted, and after the crew was accounted for and debriefed, they departed for the day.